My great-great grandfather and I were best of friends, although we never met. Fire and shipwreck orphan us – 140 years apart. We escape to imagination to survive our fate. There, midst flights of whimsy we find one another. Companionship quells our loneliness. We create fables and tales, shields against a harsh existence. We must battle animals and humans of prey. Together, he, the future abolitionist-publisher James Thaddeus ‘Blackjack’ Fiction, and I vault from glory-laden adventures to tragedy and then to triumph. I am Raji Singh and this is my story. 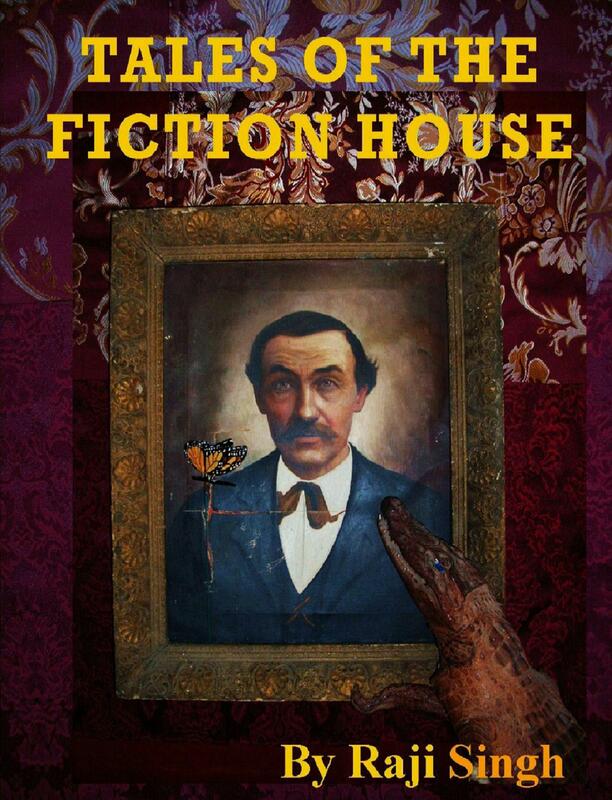 Tales of the Fiction House, for adults but suitable for younger adults, follows in the grand tradition of Aesop, Grimm, and Hoffman. Whether you’re spending 1,001 nights in Bagdad, itching to hitch a ride on the Canterbury trail, or wringing your sweaty Hans Anderson on a hot summer day, you’ll enjoy a cool respite with these all new legends and myths. You’ll encounter a land-sea creature with as many tattooed tales on his shell as his shipmate an ancient mariner, the Poseidon of whale-talers, can ever spout-out. You’ll sail along on the Beagle and be privy to Charles Darwin’s Victorian secret romance with Harriet Beecher via carrier pigeon air-mail. You’ll claw your way through jungle dangers with the help of a kind ‘Tiger-man’. Vicious ‘gator-men’ will lore you to their swamp. The stories’ wise ladies, a gentle butterfly named Calico, and a hardened ‘Captain Polly’, will fly you to exotic worlds no human’s ever seen. A thousand and one Tales inhabit the Fiction House. You’ll want to visit them again and again.